We have had so much rain this past week but today, it is 75, the skies are clear and the sun is shining. 😀 WHAHOO ❗ As you can see though, the lake is till really high. I am glad I did not put our little solar lights out too far yet. ATV trail update from our riders this weekend… Mark said that there are so many little creeks and babbling waters out there that he has never seen before that it made it worth the ride. Some areas were muddy but they found some great areas to ride. He also found an area just south of here where Mom and baby Moose were having some fun in a bog. Hopefully this sunshine will help dry out the trails and lower our lakes! 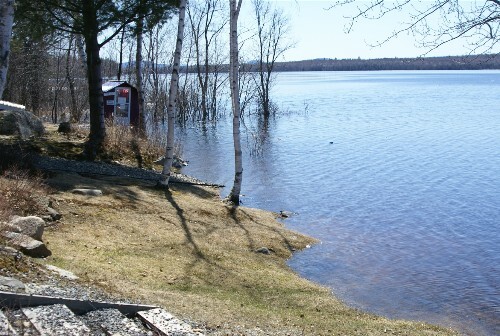 As you can see, the lake is still quite high but the paddle boats and canoes are out and ready for our weekend guests. This is the beginning of a great summer! 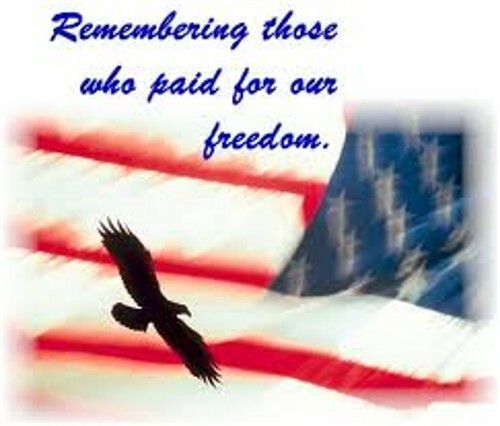 We hope you enjoy your Memorial Day Weekend: a time we all seem to enjoy as our first weekend of summer, but please, do not forget why it is so. First and foremost, as we enjoy our families and our freedom, we should remember those who have lost their lives as they defended this nation and pray for those in the military who are still doing so. God Bless our Troupes. We came here on our honeymoon. I was so charmed when we came in-this cabin was perfect, especially with the kitchenette and shower. We went waterfall hunting-we found “the Falls” just off N201, the Herald Stream Falls, & the Moxie Falls (S201). We looked for the COld River Falls but could not find it. “The Falls” was the prettiest but Moxie was impressive. We also went canoeing, exploring Big Wood lake. The 1st day we went to the southern tip of Hog Island. We saw some MASSIVE birch trees, bigger then I-d ever seen. There was also one part that was like a tree cemetery; more fallen trees then standing, in various states of decay., some only half fallen, their strips of bark hanging from the neighbor tree-s branches. Running back across this tip I startled a Mamma Grouse (dunno if it was a ruffed grouse) Suddenly, she was up in my face flapping frantically & hissing. I looked down & at my feet saw her nest, with perfect pearly white eggs laying in the leaves. The mamma continued to circle me & hiss, her feathers all puffed up. I backed up slowly & made a wide detour around her nest. It was a windy day so hard work getting back to camp-520 paddle strokes on my part. Probably over 1000 for the whole excursion. 2nd day went canoeing down to where Attean Pond flows into Big Wood, to see the bridge (K Truss) Calm day, very nice paddling. Well over 1000 strokes there and back. Saw a bunch of loons. We-ve also enjoyed playing cribbage in the evenings and having dinner “IN”. Happy Friday the 13th 😉 and what an incredible day it is. 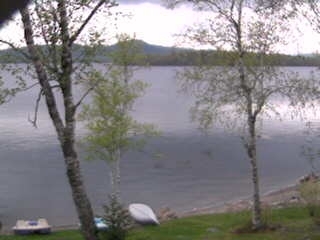 You can now see some grass from our webcam….the lake water is receding:D The temperatures today were around 75, blue skies, and still no black flies. 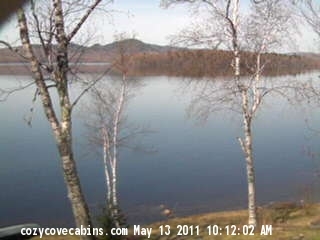 Today, May 5th, 2011, begins our 8th year 😯 here at Cozy Cove Cabins ❗ We have been so blessed to have met so many new friends during the past 7 years and to live in this beautiful place 😀 so we will take this opportunity to thank you to those of you who keep coming back and to welcome the new. Happy Cinco De Mayo also…. ➡ We saw a Pontoon Boat touring the lake today. I am sure there are other signs of spring popping up around here but these are all I can think of right now. The sun is shining and a beautiful day so I want to be outside enjoying this.